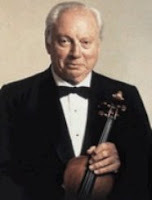 Isaac Stern was a Russian (Ukrainian) violinist, teacher, and writer born on July 21, 1920 (Heifetz was 19 years old.) His family came to the U.S. when he was less than two years old; he thus received his entire training in the U.S. Other than as a touring virtuoso with a vibrant, robust sound, he is remembered for saving Carnegie Hall from demolition (1960), for his tours of China, and for a comprehensive discography (more than 100 recordings.) Having started music lessons with his mother, he enrolled at the San Francisco Conservatory in 1928 (age 8). One of his first teachers in San Francisco was Robert Pollak, an Austrian violinist who had recently arrived in the U.S. In 1931 (age 11), he studied privately (in New York) with Louis Persinger, who also taught Yehudi Menuhin, Ruggiero Ricci, and Zvi Zeitlin, among others. He returned to the San Francisco Conservatory to study with Naoum Blinder (a student of Adolph Brodsky) for five years. Blinder had taught at Juilliard (New York) between 1929 and 1931. Blinder was concertmaster of the San Francisco Symphony until 1957. Stern gave most of the credit for his training to Blinder. Stern made his public debut at the age of 15 (February 18, 1936) with the San Francisco Symphony. Some sources say he played Saint Saenz’ third concerto on this occasion and others say it was the Brahms concerto. Yet another source says he played the Bach Double concerto with his teacher (Blinder.) [His memoirs probably mentions something about this but I haven't read the book and I have no intention of reading it.] The following year, he made his New York Town Hall debut, which did not go well. He returned in 1943 to debut at Carnegie Hall, after which his career took off. Stern soloed with the New York Philharmonic for the first time in 1944. His European debut came in 1948 and his Russian debut in 1956. So influential did he become, that it has long been rumored that he could make or break any classical musician’s career. He was married three times and had 3 children from his second wife. Stern owned several fine violins, including the Ysaye Guarnerius Del Gesu (1740) which he sold three years before he died. He died on September 22, 2001, at age 81. Stern's discography was actually a fraction of what Jascha Heifetz, Ruggiero Ricci, Louis Kaufman, and Steven Staryk recorded.